"My first solo album on Capitol was I Wish You Love with Nelson . No one could get to Nelson. He really belonged to Frank," Keely explained. "I'm sure that Frank had a lot to do with me getting him." Keely had already covered some formidable musical ground, including scads of hit records and a Grammy win) with ex-husband Louis Prima. She enjoyed a strong professional relationship and per-sonal friendship with Sinatra and greatly respected his melding of artistic and com-mercial success. And Frank, in turn, clearly admired Keely. As soon as her contractual obligation to Dot ended in late 1962, he brought her to Reprise. In January 1963, at Frank's suggestion, Keely entered a New York studio to record a single with one of his new "favorite" arranger-producers: Don Costa. That non-LP single is included here in stereo for the first time, having been restored from the original masters. Impressed with the results, Sinatra helped plan Keely's first LP for the label, Little Girl Blue/Little Girl New, recorded in early spring 1963. It marked Keely's first full-fledged Reprise album - and the first major project for her own company, Keely Records. The LP represented an artistic reinvention - a chance for Keely to show-case her solo prowess on a dozen classic and contemporary standards. Strikingly di-verse, the "double 'A' side" concept album featured two front covers and the best of all musical worlds. While he'd previously arranged and recorded many of the songs on Little Girl Blue with other vocalists, Riddle devised vastly differ-ent musical settings for Keely's versions. All the hallmarks of the Riddle style are there: the sinewy, melodic bass trombone lines, the effortless ebb and flow of the strings, the relentless driving of the drums, the taste-ful use of percussion and woodwinds, and Nelson's exquisite use of the harp. It's the way the arranger employs these sounds that separates Keely's orchestrations from his others. A perfect illustration of this is the ultra-romantic harp introduction for "Gone with the Wind." He'd arranged the song for Sinatra's Only the Lonely album five years earlier, yet the treatment he created for this album with Keely bears little resemblance to the earlier recording. The flip side of the album - Little Girl New - offers a vibrant program of contempo-rary songs brimming with optimism and vitality, opening with "I'm Gonna Live Till I Die." Here, Riddle gives it the full-tilt big band treatment at breakneck tempo. The brass bites, the reeds sting, and unre-strained sax and trombone solos offer the perfect backing for Keely's high-intensity vocal. Her perceptive renditions of "It's Good to Be Alive," "A Lot of Livin' to Do" (from the Tony-winning musical Bye Bye Birdie), "New Sun in the Sky" (from the musical comedy The Bandwag-on), and "Blue Skies" round out a thor-oughly swinging set that highlights Keely's superb jazz sensibilities. With this album, Keely and Nelson sought to present a program rich with contrast and dichotomy. Daring at the time, the concept could have easily failed. But, as this newly restored edition of the album attests, Little Girl Blue/Little Girl New was solid in both concept and execution - an album that is as delightful today as it was fifty-four years ago. Once again, Billboard highlighted Keely's efforts in its June 29, 1963 issue, selecting the album for Special Merit in the Pop category: "Whether Little Keely Smith is Little Girl Blue or Little Girl New, she's fine on this new package. She generates lots of excitement, whether it's on an up tempo ditty like 'A Lot of Livin' to Do' or a more relaxed 'Gone with the Wind.'" The word to describe the Keely Smith-Nelson Riddle partnership is simpatico. "Nel-son was quiet - very much in command and in control," said Keely. "He was kind, and I wasn't afraid of him, or making the album. I always had this thing that what-ever I had to do, I just went and did it. I never thought about how big it was, how important it was, or how wonderful it was having your own contract. I was a girl liv-ing her life with her family, and singing is what I did." As with the music, Frank Sinatra's masterful, generous gift to his Reprise cohorts — ownership and control of their master recordings — endures. Keely Smith and Nancy Sinatra (two of the last surviving "original" Reprise artists) — as well as the estates of Dean Martin, Sammy Davis, Jr., Bing Crosby et al — still benefit from this proviso, and it's one of the primary rea-sons why magnificent albums such as Little Girl Blue/Little Girl New can be presented to a new and adoring audience. 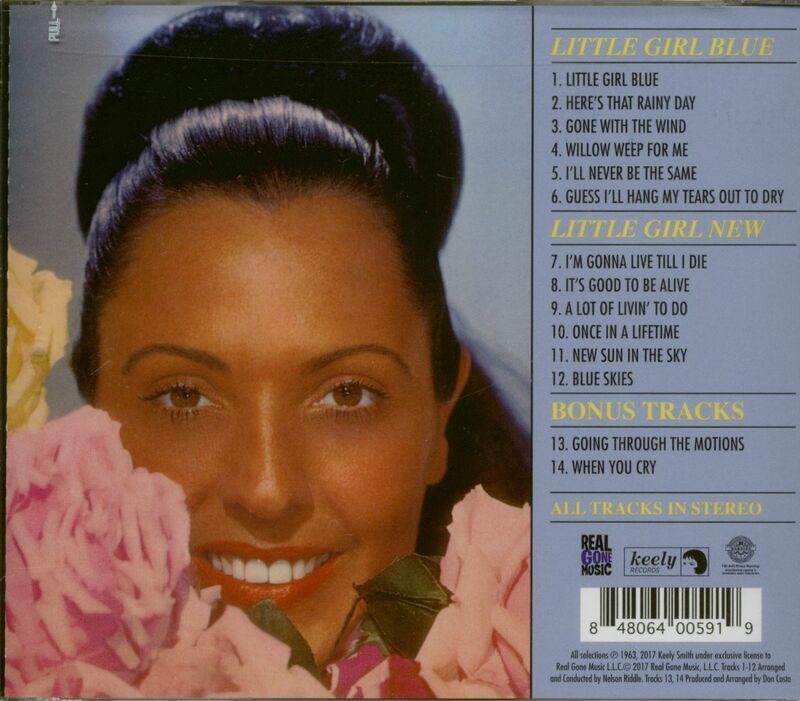 Little Girl Blue/Little Girl New is an album of top-quality songs, beautifully arranged and sung to perfection. I hope you enjoy it as much as I do! Customer evaluation for "Little Girl Blue (CD)"